WNYC: "Girls and Power in the Age of Trump"
In this WNYC segment from September, young women reflect on what it means to be female in the current political climate. Their impressions highlight empowerment and progress for women as well as a culture of sexism that has been in some ways reinvigorated by Donald Trump's election. See Our Truth provided a number of testimonies from students of color living all around New York state highlighting the impact it had on their education to be taught by teachers of color who reflect the diversity of the country. 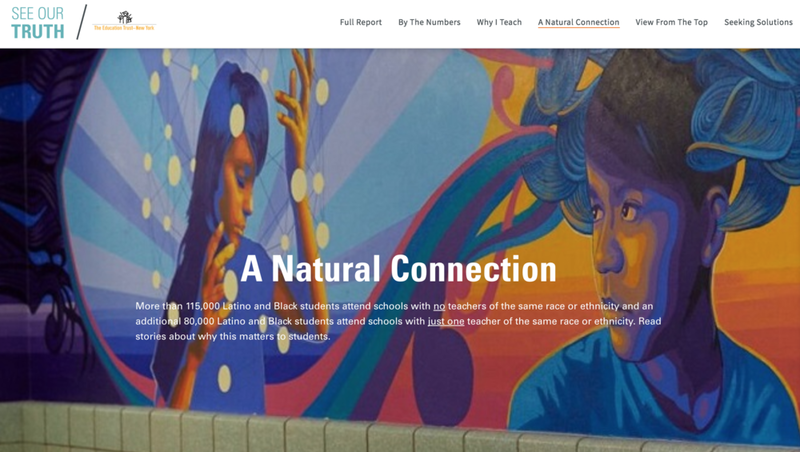 This past October, See Our Truth published a report that spoke to a need for schools to ensure diversity among their educators in order to cultivate inclusive learning environments for students of color. The story of IntegrateNYC and the massive effect it has had on the community was featured in an article written by Julie Zdonek from the Beloved Community.